Urothelial cell carcinoma in renal transplant recipients has been rarely reported. Here, we report a case of high-grade papillary urothelial carcinoma in a renal transplant recipient who presented with hematuria. Sonographic evaluations (gray-scale ultrasonography, Doppler imaging, and strain sonoelastography) helped with diagnosis in our initial approach to the patient. Computed tomography was performed to confirm solid ureteral masses and staging of the disease. The patient, who underwent nephro-ureterectomy of the graft kidney, had that kidney for 6 years, 6 months. After surgery, the patient was symptom free and without evidence of recurrence or metastasis in 3 years of follow-up. Sonographic examinations have an important role in the evaluation of urothelial carcinoma of transplanted kidneys. 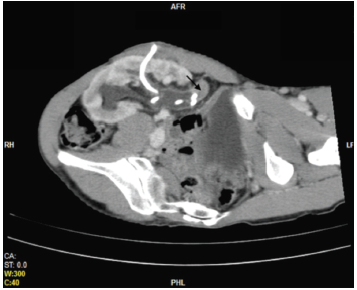 There have been many reports about transitional cell carcinoma, but only a few cases of transitional cell carcinoma affecting the renal allograft have been published.7 Here, we present a rare case of urothelial carcinoma that developed in the collecting system of an allograft kidney. A 30-year-old male patient who had received a deceased-donor kidney 6 years and 6 months earlier presented with hematuria. Serum creatinine level was high (9 mg/dL). Sonographic examinations and computed tomography were performed. The radiologist used a Logiq S7 Expert machine (GE Healthcare, Milwaukee, WI, USA) equipped with a C1-5-D convex probe for the gray-scale and Doppler ultrasonography and elastography examinations. 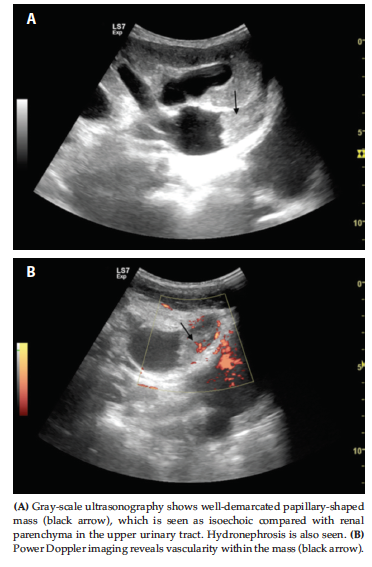 The ultrasonography revealed urothelial mass, hydronephrosis, and a renal millimetric stone (not shown) (Figure 1A). A soft tissue area, which obliterated the ureteric lumen with clearly visualized blood flow inside the mass at power Doppler ultrasonography in the upper ureter, was also detected (Figure 1B). Strain-type elastography confirmed that the urothelial lesion was stiffer than renal parenchyma (Figure 2). A percutaneous nephrostomy was placed into the collecting system, and the patient showed subsequent decreased creatinine level. Previous imaging findings were next confirmed by computed tomography, and soft tissue filling the upper ureteral lumen was observed (Figure 3). Biopsies of the papillary lesion were performed during antegrade ureteroscopy. Histopathologic results confirmed high-grade papillary urothelial carcinoma with focal lamina propria infiltration, and the patient underwent nephroureterectomy of the allograft. Final pathologic examination revealed high-grade papillary urothelial carcinoma of the ureter and renal pelvis in the allograft kidney in 3 focuses. Millimetric renal cell carcinoma in the renal parenchyma was also noted, which could not be visualized by either ultrasonography or computed tomography. After surgery, the patient remained symptom free without evidence of recurrence or metastasis in 3 years of follow-up. Renal carcinomas make up 4.6% of posttransplant cancers versus 3% of cancers in the general population.10 For renal transplant recipients, renal cancer can develop both in the transplanted kidney and in the native kidney.11 The incidence of urinary tract cancers is increased after kidney transplant.3 Urothelial cell carcinoma, also called transitional cell carcinoma, is the most common primary malignancy of the urothelium, accounting for more than 90% of tumors.1 Squamous cell carcinoma, adenocarcinoma, and small cell carcinoma occur less frequently. The most common presenting symptom is painless hematuria. The disease course of patients who have been diagnosed with urothelial carcinoma after renal transplant and immunosuppressive therapy is aggressive. A detailed evaluation of possible urothelial carcinoma is necessary when a renal transplant patient presents with hematuria. Ultrasonography is the main diagnostic tool to be used after the physical examination and laboratory evaluation of the patient. Winalski CS, Lipman JC, Tumeh SS. Ureteral neoplasms. Radiographics. 1990;10(2):271-283. Leder RA, Dunnick NR. Transitional cell carcinoma of the pelvicalices and ureter. AJR Am J Roentgenol. 1990;155(4):713-722. Vajdic CM, McDonald SP, McCredie MR, et al. Cancer incidence before and after kidney transplantation. JAMA. 2006;296(23):2823-2831. Gottlieb RH, Voci SL, Cholewinski SP, et al. 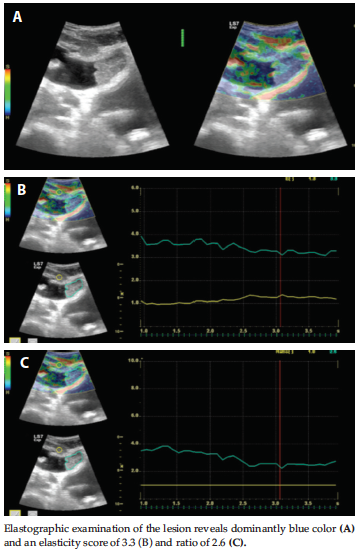 Sonography: a useful tool to detect the mechanical causes of renal transplant dysfunction. J Clin Ultrasound. 1999;27(6):325-333. Baxter GM. Ultrasound of renal transplantation. Clin Radiol. 2001;56(10):802-818. Vikram R, Sandler CM, Ng CS. Imaging and staging of transitional cell carcinoma: part 2, upper urinary tract. AJR Am J Roentgenol. 2009;192(6):1488-1493. Vervloessem I, Oyen R, Vanrenterghem Y, et al. Transitional cell carcinoma in a renal allograft. Eur Radiol. 1998;8(6):936-938. Kasiske BL, Snyder JJ, Gilbertson DT, Wang C. Cancer after kidney transplantation in the United States. Am J Transplant. 2004;4(6):905-913. Barrett WL, First MR, Aron BS, Penn I. Clinical course of malignancies in renal transplant recipients. Cancer. 1993;72(7):2186-2189. Penn I. Primary kidney tumors before and after renal transplantation. Transplantation. 1995;59(4):480-485. Hiesse C, Rieu P, Kriaa F, et al. Malignancy after renal transplantation: analysis of incidence and risk factors in 1700 patients followed during a 25-year period. Transplant Proc. 1997;29(1-2):831-833. Subramanyam BR, Raghavendra BN, Madamba MR. Renal transitional cell carcinoma: sonographic and pathologic correlation. J Clin Ultrasound. 1982;10(5):203-210. Grant DC, Dee GJ, Yoder IC, Newhouse JH. Sonography in transitional cell carcinoma of the renal pelvis. Urol Radiol. 1986;8(1):1-5. Altinbas NK, Gundogdu Anamurluoglu E, Oz II, et al. Real-Time Sonoelastography of Parotid Gland Tumors. J Ultrasound Med. 2017;36(1):77-87. Cohen WM, Freed SZ, Hasson J. Metastatic cancer to the ureter: a review of the literature and case presentations. J Urol. 1974;112(2):188-189.